2018 will see Italian style-hub Milan host the 57th edition of Salone del Mobile, the world’s largest and most influential furniture and interior design fair. Launched as a furniture-focused showcase of the world’s greatest designs, original sponsors of the fair were manufacturers from the Federelegno-Arredo trade association, but these days the show itself welcomes more than 2000 exhibitors, while the number of brands, studios and designers contributing the city-wide event can be in excess of 13,000. Also known as Milan Design Week, this year’s event will take place 17—22 April and will have been highlighted in the diaries of architects, interior designers, design tourists and journalists alike for many months prior. Regular Milan-goers will agree that accommodation is in short supply and you can end up scattered across the stunning urban landscape, but Salone veterans also know that there’s only one place to be at the end of each day. 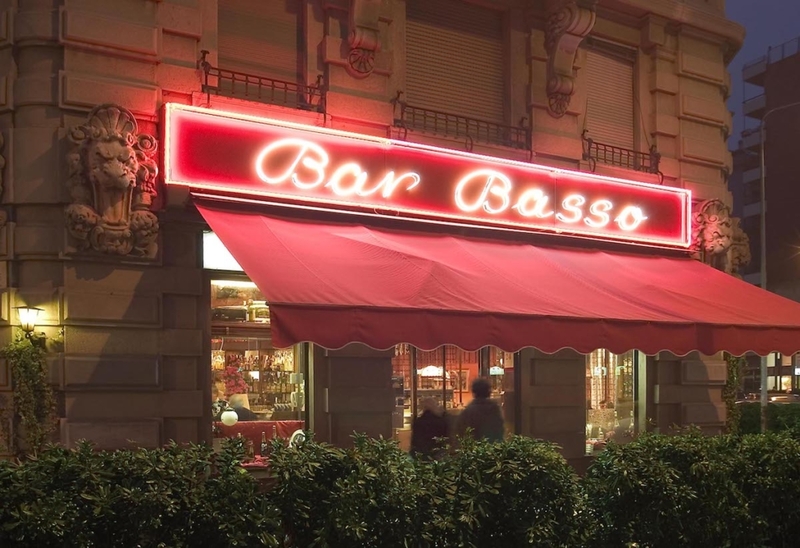 Bar Basso is arguably Milan’s most famous watering hole. Recognised for its traditionally Italian interiors, and rumoured to be the birthplace of the Negroni, design lovers spill out across the streets surrounding the tiny bar and come together to swap stories about the sights they’ve seen across the city each day. 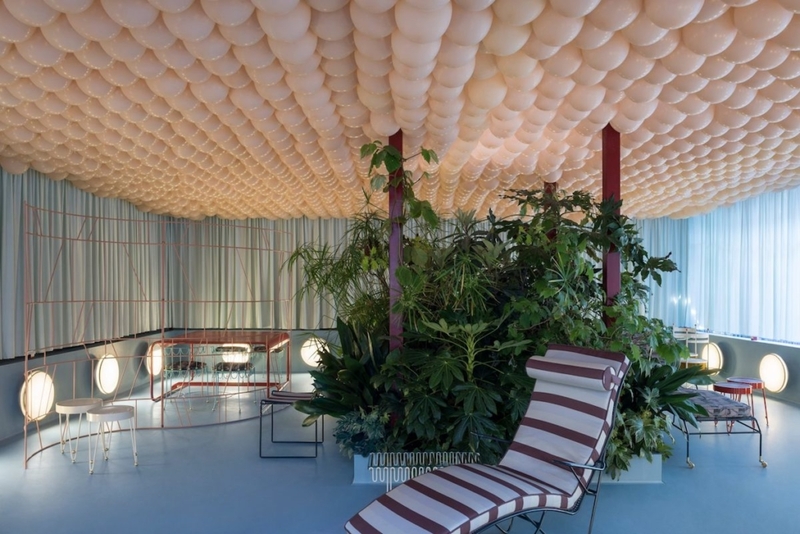 As uncovered by Wallpaper* in this fascinating insight, the tradition began when the bar’s owner Maurizio Stocchetto became friends with a group of up-and-coming English designers in the 1980s. The group included the late James Irvine, who lived in Milan and worked for Ettore Sottsass, founder of the Memphis movement. It’s more than just tradition, espresso and perfect Negronis that keep the spirit of Salone del Mobile alive year after year. 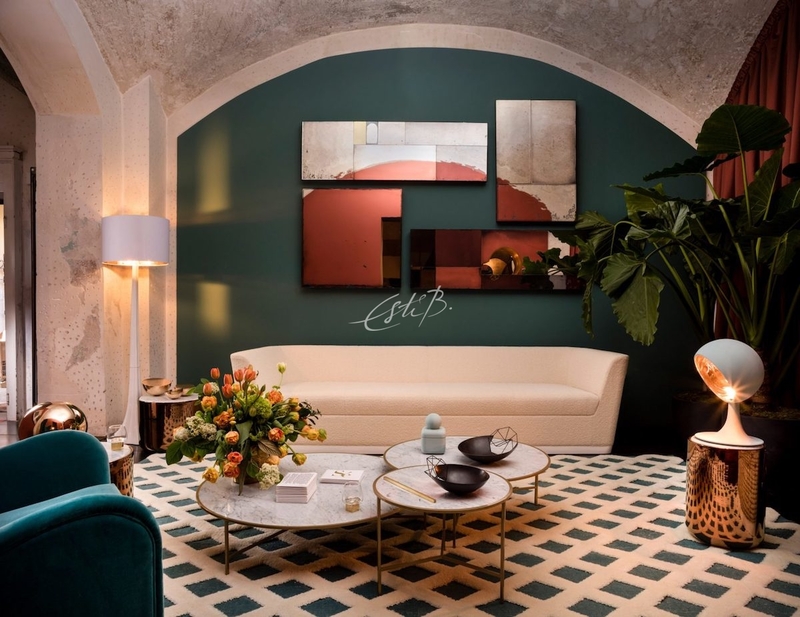 For interior designers, architects and brands, the Milan fair is the go-to destination for launching and discovering the latest collections, trends and innovations. The best way to stay ahead of the curve and be the first to utilise new materials and process? Head to Milan and hope you find them first. Italian giants such as Minotti and Versace use Salone’s vast exhibition halls to offer an exclusive look into their fiercely guarded new releases, whereas global industry leaders such as Dimore Studio and Kirkby Design utilise the city’s charming streets and beautiful buildings to add glamour and quirk to their showcases. 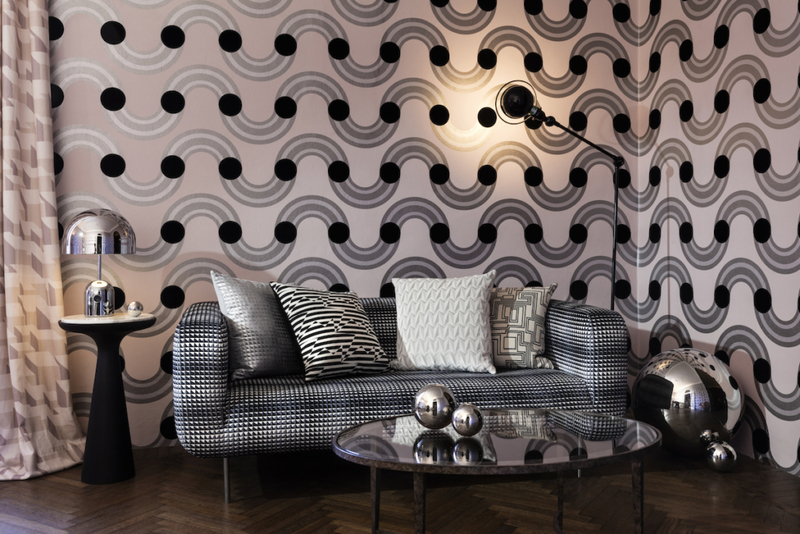 Some have been know to take up residence in the iconic cinema and galleria on via Manzoni, while British textile design house Kirkby Design harnessed the beauty of a classic Milanese apartment to create a show-house for their collaboration with Brixton graphic art duo Eley Kishimoto. 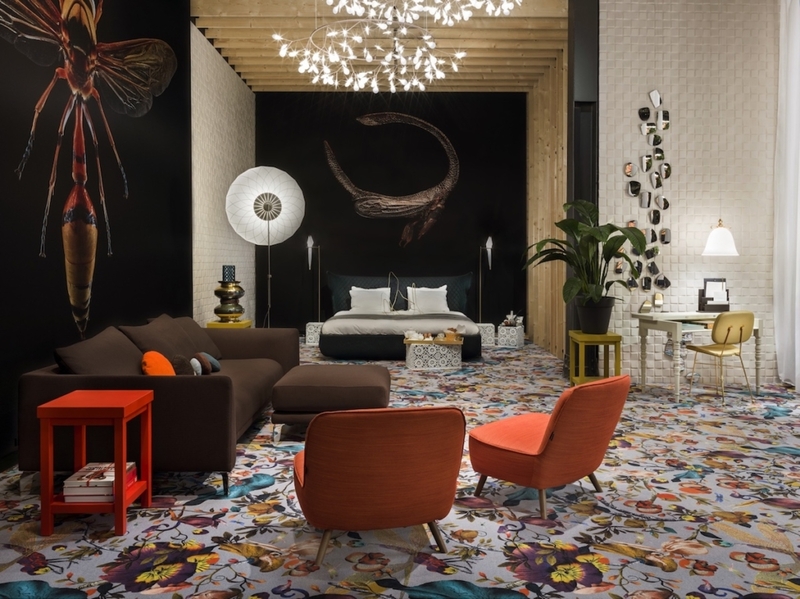 One of our favourite moments from 2017 was Moooi. Under the artistic direction of famed designer Marcel Wanders, the brand launched ‘A life Extraordinary’ and revealed new works set against the opulent beauty and colour of bugs from the Oxford University Museum of Natural History’s collection. The level of research conducted by an astounding team of biologists allowed the designs to encompass hyper-realistic photographs within the show and applied to printed carpets unrivalled in detail. Other highlights included Paola Lenti’s vibrant feast for the eyes and the diverse quirks of Rossana Orlandi spotted around the city. There’s lots to see during the design week, so it’s worth getting your head around the geography of the city ahead of any visit. The main hot spots are Brera Design District, Ventura Lambrate and Zona Tortona, while the main show itself, Salone del Mobile, is a brief metro ride north west of the city centre at Fiera Milano. The key to making the most of any of these design playgrounds is carb-loading with pasta and pizza from local restaurants, cobble-friendly footwear and a childlike sense of curiosity.